Odin is a Marvel character based off the mythological Norse god Odin. Odin was the father of the main branch of Norse deities the Asir/Asgardian. The primary Asir/Asgardian hero in the Marvel universe is Thor, who is Odin's son. Actor Anthony Hopkins plays Odin in the films Thor 1, and Thor 2. Odin is generally considered to be one of the most powerful characters in the Marvel universe. Odin is the son of the Asgardian King Bor (First Asgardian) and Bestla (First Frost Giant). He has two brothers named Vili and Ve. During a battle with the fire demon Surtur his brothers sacrifice themselves and give Odin their powers. With combined might of his brothers he defeats Surtur and imprisons him inside of Midgard (aka Earth). The powerful Odin becomes the ruler of Asgard and is given the title All Father. He sacrificed his right eye to Mimir for wisdom. Potentially, the wisdom to stop the cycle of Ragnarok in witch his people are slain and reborn to provide energy to a group called "Those who live above in Shadow". Odin has a romantic relationship with Gaea (Mother Earth) and from this relationship Thor is born. This relationship is relatively short lived and after Thor's birth Odin returns with the boy to Asgard. Odin's wife Frigga acts as Thor's mother. Odin goes to war with the Frost Giant King Laufey and slays the savage Frost Giant in personal combat. Inside of Laufey's fortress he finds a young giant child who is the size of an Asgardian. He names the child Loki and raises it as his own. Bor had cursed Odin that he would adopt a child of his enemy. This child was meant to be Odin's downfall. Despite his best intentions his sons Thor and Loki become bitter enemies. Other children of Odin include Frigga (Yes his wife) and Balder. 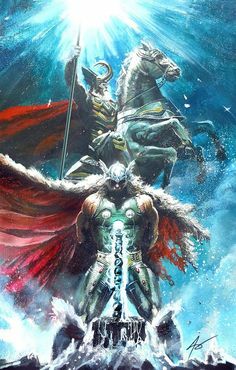 The powers of Thor have been removed a few times generally on the behest of Odin for Thor either being arrogant or for his obsession over Earth. Thor's brave actions generally convince Odin to give his powers back. Odin also would rather Thor be romantically involved with the Asgardian Sif than the human Jane Foster. Asgard has faced many crisis which Odin has helped fight off. In three of these stories Odin was in fact slain only to be brought back. These battles include fights with: Loki, The Absorbing Man, Mangog, Storm Giant Skagg, Surtur, and Dormammu. At different times Odin has appointed different Asgardians to act as his successors either due to his death or do to him requiring a deep sleep to recharge his powers (The Odin Sleep). These appointees have included Heimdall, Balder and Thor. Odin is generally considered to be one of the most powerful characters in the Marvel universe. Actor Anthony Hopkins plays Odin in the films Thor 1, and Thor 2.